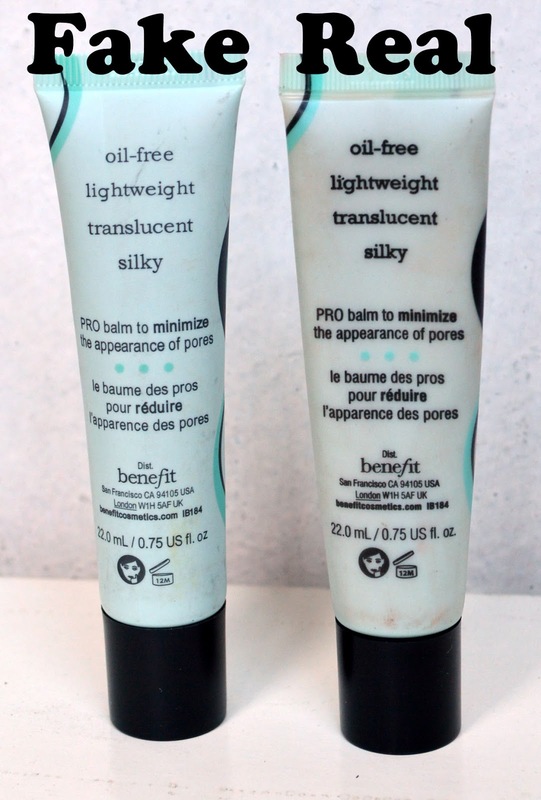 It's been a long time since I last put up a post since I've been really busy with Junior Internship... anyway, one of our residents came up to me and asked me if I knew anything about Benefit's Porefessional since she recently bought one at a bazaar for Php 300 pesos. Well, she pointed out that the price was too good to be true so she thought it might be fake. 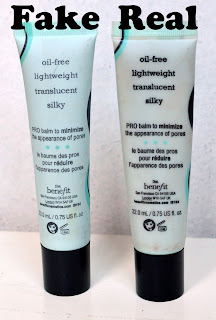 It was quite heart breaking to find out that they do sell fake copies of this product... so as a service to our fellow make-up enthusiasts, I give you today's yuck alert fake copies of Benefit's The Porefessional. 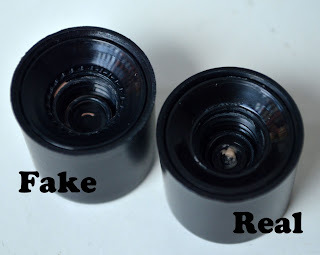 If you see the product by itself without seeing it side by side with the real one, you'd be fooled a little since the differences are very minimal. So I'll show them to you side by side. This has got to be the most obvious one even before you see the actual product content. Obviously, They wouldn't have left that part to be colored differently. The caps are also somewhat dissimilar... still minimal though. The biggest giveaway, of course, is the product. As you can see, the fake one consists of something like a BB cream compared to the real one. 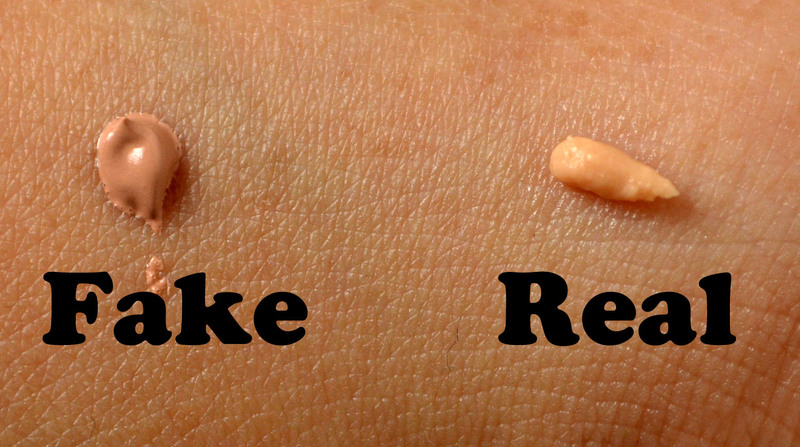 The consistency and the finish feels much like that of a BB cream. The real Porefessional however has a silky-powdery finish. 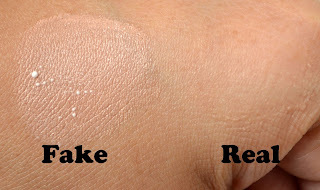 When you try blending it out or applying it, the difference is more obvious. As you can see the fake one blends out poorly, it separates and leaves a really white cast and hardly does any covering of lines/pores at that. Unfortunately, the person who bought this already forgot the name of the store from which she bought it from but I hope this will help you distinguish the real from the fake. She said some shops even try to sell this for Php 800. Yikes! Anyway, that's it. Hope this has helped you out. Such a shame! Tssskk Thanks for sharing! ugh! I hate fake makeup! there's loads of fake dollywink products going around nowadays also esp the liners! disgusting! ugh i hate fake makeup! lots of fake dolly wink products narin nowadays! ang dami nito sa Divi! pati Dolly Wink dami fake. some online sellers kasi don't care kung fake basta kumita sila eh :/ tsk! I had these feeling na basta kahit may isang fake na tinitinda sa isang online store.. I would assume na fake na lahat.. just taking precaution talaga.. Takes for the helpful post. 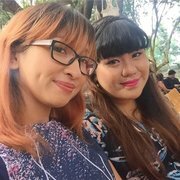 We're friends both enamored with makeup and everything nice! And - well, we're pretty in peach and pink! Essence Long Lasting Eye Pencil in C'est La Vie! Affascinante Salon Case # 1: Trace's hair is straight and short!